Signature Iron Doors has built a strong repertoire in Scottsdale Arizona with more than 60 clients and more in the production process. Call us to find out why families and individuals throughout your area entrusted Signature Iron Doors with their entry door. Each door built by Signature Iron Doors is built to beautify and secure a home and we are committed to building to fit your home and vision. 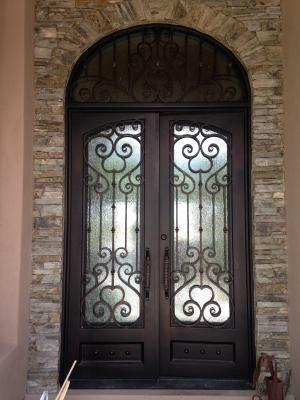 Come stop by our showroom in Phoenix Arizona to see more doors like this Scottsdale home entry door shown above and discuss with a sales representative how to enhance your home with a Signature Iron Door.